There are places in the area where you live, that you can take for granted. They are always there, supported by the town or a wide group of people; existing. They provide a nice service, one that you may or may not take advantage of over the course of your living in that area. 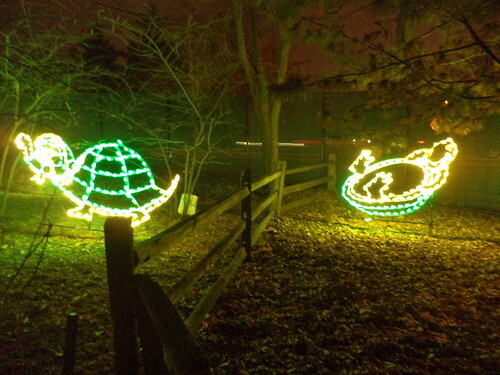 One such place in Wheaton, where I live, is Cosley Zoo. It's not a "zoo" in the traditional sense. They used to be more zoo-ish when Carole was little, with a wide variety of animals. As they aged, they moved away from the collection aspect to providing a place for kids of all ages to learn about farm animals. They have several aviaries and do wildlife management, but the deer and foxes and the wide variety of pheasants, yes pheasants, are gone. In their place are cows and sheep and a donkey and a couple of llamas. In the warm weather, there are ducks and chickens. And, probably most importantly, there are programs about the kinds of animals you're likely to see in your yard and how we need to take care of the land and the animals because it takes care of us in return. At Christmas, however, the place becomes magical. 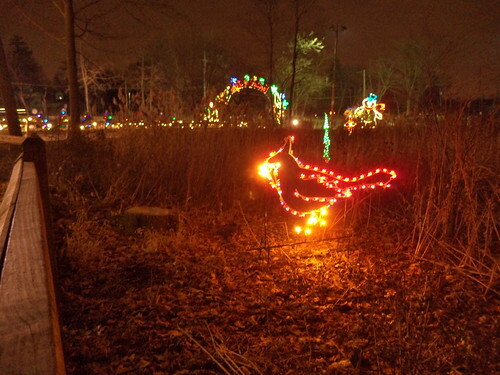 They put lights all over the zoo area. I've never seen them do it either and I've driven by the zoo many times (It's on the way to my rheumatologist.) It's like someone waves a wand and the lights magically appear. The place isn't very big, by zoo standards, but it's a comfortable walk. We decided Larry needed to see this and, as Carole and I discussed, the last time the two of us were here, it was 55 degrees and a bit foggy. We grabbed Carole's friend, Phil, and wandered around. It was about 32 degrees and they were doing a brisk business in hot beverages. This is a former train station which was moved to the property and renovated as offices, gift shop and small snack stand. There is a caboose on the opposite side of this. It used to be covered in lights but was not this year. 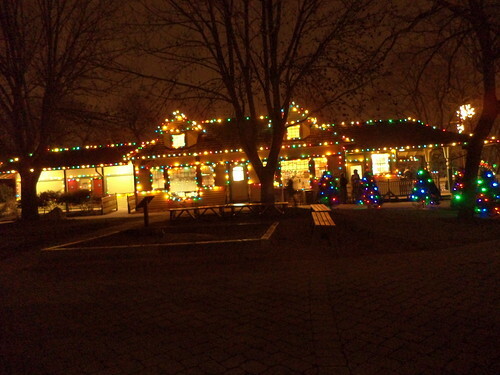 I have to confess that, while I noticed the lights as I passed by Cosley, I really didn't pay much attention to them. 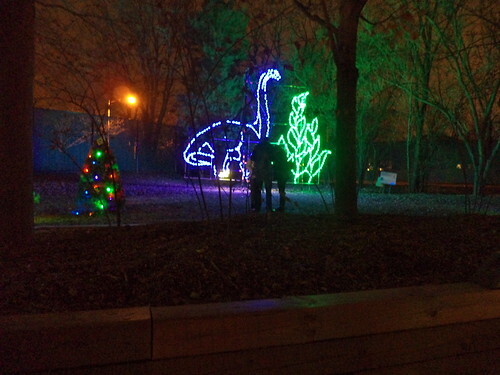 This dino would bend down and "eat" the top of the tree. 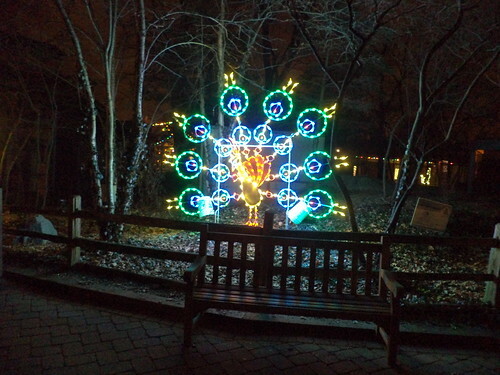 The peacock's feathers would light up one by one, flash all together once, and repeat. 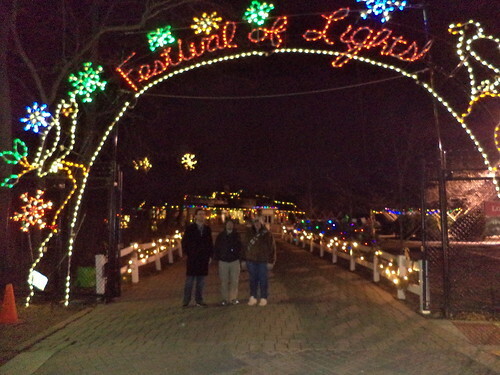 It's all free and, even in the chill, was a delightful way to kick off the evening of the first day Carole and Larry were in Wheaton. It made me realize that I should get out and just do things, even these little things. 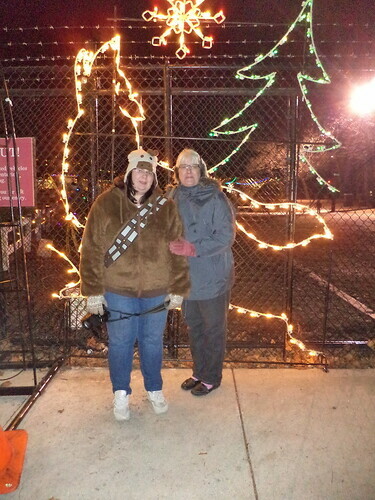 We spent an hour just walking around, looking at the lights. There are so many places like this near where I live. A 10 minute drive for an hour of free fun is worth it. I tend to isolate myself because I don't want to go out when it gets dark. It's a mindset issue. "Going out" does not have to involve a lot of money. What could I find if I went out at least once a month? It's something to consider.